Val doing a Clean and Jerk during today's WOD. Brandy watches the stopwatch while Kyle sits tight. William Blake - A Poison Tree. CHAMP and ACSM discuss high intensity fitness programs for military application. Neil Amonson by Tobias MacPhee. How to Pack Smart for a Trip. Kevin Montoya 4:18/1050lbs, Kristan Clever 6:45/1015lbs, Rebecca Voigt 6:23/750lbs, Lindsey Valenzuela 8:32/960lbs. Post time and total of all successful snatches to comments. Do not count missed reps.
CrossFit Level 1 Certificate Courses: CrossFit Velocity, CrossFit SS, CrossFit FX TX, University of San Diego, CrossFit Fort Meade. CrossFit Coaches Prep Course: Trident CrossFit. CrossFit Kids Course: CrossFit Novato. Michelle Kinney: 20-25-30-35-40-40-45lbs at 135lb BW. Brent Peters, Whore House Hoses, Silverton, Colorado. 18 Squats with 25lb plate. Post the number of rounds completed. Becky performing a Dead Lift while Paige looks on. Ken Gall 9 rounds + 3 push press, Lucas Brainerd 7 rounds. Mike's ready to lock out on his deadlift at BU CrossFit. "Rate Of Uninformed Conversations About Navy SEALs Skyrockets", the Onion. Everything is back up and normal, sorry for the inconvience. Sorry guys the server went down Thursday night and they had to erase your post. Brian Kirkendall, Tybee Beach, Georgia. Keegan Martin (age 17) 7 rounds + 5 MU, Kristan Clever 7 rounds, Kevin Montoya 7 rounds, Jake Cutting 6 rounds + 6 MU, Rebecca Voigt 5 rounds, Philip Lamborn (age 17) 5 rounds. Update on the Open: Week 7. "Water-Propelled Jetpack Makes a Splash" by Nic Halverson, Discovery News. 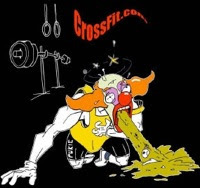 Dave Lipson 9:03, Kristan Clever 14:04 (135lb OHS, 40lb dbs). "This is my client Ken Tower from Boise, Idaho. He is 61 and does a CrossFit workout at least 3-5 days a week. He has had 6 knee surgeries and competitively alpine snowboards throughout the winter." "Great men are rarely isolated mountain peaks; they are the summits of ranges." Parker Eiler and Victoria Stringfellow, Lightning CrossFit. "Navy SEAL honored with warship bearing his name" for Lieutenant Michael Murphy. Kim Malz 9 rounds + 4 pull-up (16lb ball, 1.5pood). Post rounds completed to comments. CrossFit Level 1 Certificate Courses: I Am CrossFit, Atlas CrossFit, CrossFit Virtuosity, CrossFit Flagstaff, CrossFit Verve. CrossFit Coaches Prep Course: CrossFit Atlanta. CrossFit Kids Course: Rainier CrossFit. Post what you worked on and what you need to improve. Michaela Deadlifting at BU CrossFit, this stuff is too easy. Update on the Open: Week 6. Dave Lipson: 405, 415, 425, 430, 435lbs. Rob Orlando at the CrossFit Sports Series MOTO X Event. "The Really Smart Phone" by Robert Lee Hotz, The Wall Street Journal. Keegan Martin 3:53 (age 17), Duncan Martin 7:05 (45lbs, age 12), Jack Marks 7:23 (45lbs, age 12). 75 Drowning and Near-Drowning Incidents in 15 Weeks, Fox News. Set up rings and box such that heels are at the height of the bottom of the rings. Austin Malleolo 16:30, Chad Wittman 16:43.